We have had guests from over 57 countries since we have been open. Here's what guests have to say about Benson Bennet House. “Thank you for your great hospitality. Keep my room open.” - Mrs. B.M. Georgetown, ONT. “You welcomed me and made me feel so at home. I loved spending time with you in your exquisite home.” - Mrs. P.W. Kings Park, NY. “Thank you so much for all your hospitality and especially your Kindness to our daughter Marie. We look forward to our next visit in your home.” - Mr. & Mrs. H. Carp, ONT. “Thank you for opening your beautiful home to complete strangers.” - J.H. & P.P. Gananque, ONT. “Wonderful time... great food, great hosts, and a beautiful setting.” - M.L. Toronto, ONT. “We enjoyed our stay thoroughly. Thank you for greeting our children with such warmth and enthusiasm.” - Mr. & Mrs. P.S. and Family Ottawa, ONT. “God bless you both for your hospitality.” - Mr. P.C. Kingston, ONT. “Good friends and warm faces. Love abides in this home.” - Mrs. S.W. Toronto, ONT. 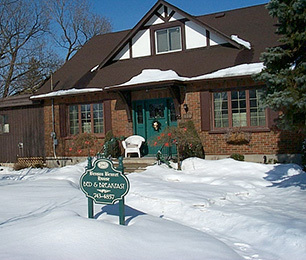 “Great B&B and Best value since we have been traveling. The healthiest breakfast, and most pleasant setting. Your hospitality and generosity warm our hearts. ” - Mr. & Mrs. N.O. Bloomfiels Hills, Michigan. “Thank you for sharing your world with me. All the best!” - Mrs. M.E.S. Ancaster, ONT. “It was such a delight to share your lovely warm home. Your kind hospitality was much appreciated. See you again Soon in September.” - Mrs. M.J.L. Ottawa, ONT. “First time B&B... we may never see a hotel room again.” - Mr. & Mrs. J.T. Port Colborne ONT. “Outstanding accomodations and great food.” - Mr. & Mrs. G.B. Timmins ONT . “Best people... best place... best breakfast.” -Mrs. V.A. Athens Greece.